William Ritchie, 90, was last seen in the West Road area of the port on January 12. Specialist officers have now expanded their search into the direction of Sandhaven. A massive search has centred around walking routes Mr Ritchie, also known as Bill, is known to use. On Sunday, officers continued to appeal for any information handing out leaflets with information about William and advice on contacting police. 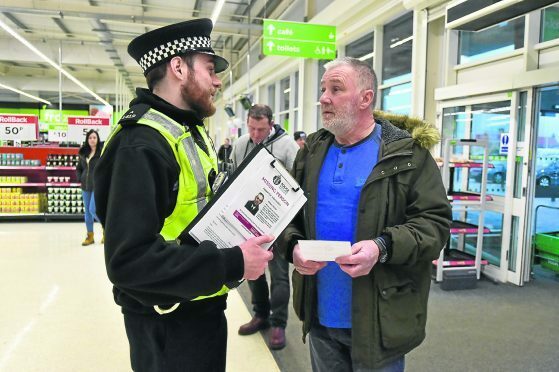 They spoke to motorists in Fraserburgh’s Boothby Road and shoppers in the town’s supermarkets and licensed premises. Inspector Kevin Goldie said: “It has been one week since Bill was reported missing and there has been no trace of him, despite a major search taking place in the town to track every route he’s been known to walk in the past. “Despite being relatively fit and healthy for his age – as far as we know – we are now seven days on and, what with the weather we’ve had to contend with, and the lack of contact, our concerns for him grow every day. Sunday’s searches came after police released CCTV footage of Mr Ritchie. The footage was taken from Asda on December 21. Mr Ritchie is described as being around 5ft 7ins, with a slim build and short grey hair. He usually wears a black jacket or a waterproof jacket with the hood up, and a flat cap. He regularly visits Asda, the local Co-op and the post office on Mid Street. Anyone with information has been asked to contact police on 101.